​Placing holes on hard surfaces such as wood and concrete can be quite tricky and tedious. This is especially true when one is drilling a hole on a bitter surface. This is the reason why hammer drills are very handy to have. One can do a lot of do-it-yourself projects or earn more money as a handyman when he or she has the best hammer drill. If you are on the lookout for one, then here are our three recommended picks. ​The Bosch HDH181XB Bare-Tool promises to be the perfect hammer drill for all your drilling needs including do-it-yourself projects and complicated construction work. It boasts of an active response technology so users will have great control in bind-up works. This product is also made for heavy duty construction work with its robust built, body and exclusive Durashield housing for Bosch. It also comes with an all-metal gearbox that is perfect for rugged job site work. This hammer drill has a maximum power of 750 in./lbs of torque that is powered by a four-pole motor. It has advanced electronics with its customized electronics to safeguard the motor as well as the battery for durability. Users can choose between two gear options with speeds varying from 0 to 440 RPMs and 0 to 1850 RPM. This Bosch drill runs on 18-volt lithium-ion batteries that are compatible with any other Bosch 18-volts batteries. The product comes with an auxiliary handle as well as screwdriver bits. Both the battery and its charger must be bought separately. This hammer drill weighs 4.85 pounds and comes with a built-in LED light for better visibility during construction work. The VonHaus 10 Amp VSR 1/2 Inch Pistol Grip Hammer Drill Kit promises to be the perfect companion for any drilling jobs. It has 10 Amp and one-half dual function pistol grill for power drilling even on hard surfaces. One can drill at different speeds with this hammer drill as it has a switch that is a variable-speed on as well as forward and backward control for a more precise job. This product also has an easy-switch selector so users can change between drilling functions. 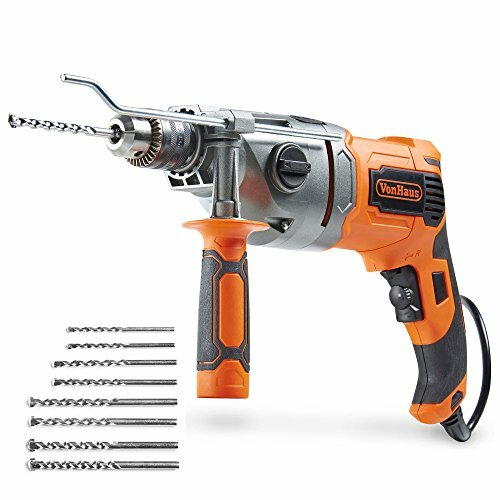 This power drill has a two-speed range of zero to 1050 RPM and zero to 3000 RPM. This construction tool also has an ergonomic design as well as an aluminum gear housing. It comes with a grip auxiliary handle that’s soft as well an integrated lock-on switch. It runs on 120 volts on a corded electric power source. This drill weighs 8.73 pounds. The product also comes with eight spare drill bits. 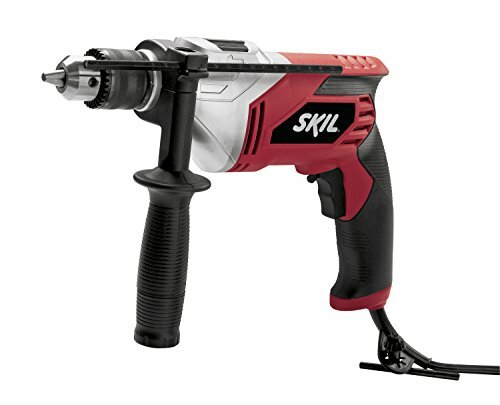 ​​The SKIL 6445-04 7.0 Amp 1/2 Inch Hammer Drill promises a powerful drilling experience with its seven amp motor and one-half inch keyed chuck for large diameter drill requirements. It has a variable speed trigger for a more precise drilling speed and can drill up to 3000 rpm. This hammer drill also uses an auxiliary side-assist handle to make it easier for the users to perform a more accurate drilling job. It runs on 120 volts that are powered by an electric cord. It weighs 5.5 pounds. The side-assist handle feels like plastic and not durable. ​All three products claim to be a great tool for drilling jobs including hard surfaces. However, not all of them delivers as promised by their manufacturers. The SKIL 6445-04 7.0 Amp 1/2 Inch Hammer Drill is not the best hammer drill of the three as its durability and safety are questionable. It drills loudly, shoots sparks out and burns quickly. Plus, its auxiliary side-assist handles are not well-made and even feels like plastic. The trigger is hard to control and most importantly, it is underpowered for heavy drilling tasks. In buying a hammer drill or any drill for that matter, one has to prioritize safety and even durability. Hard to control triggers, sparks flying and easy burning of the tool are things one must avoid in a drill. On the other hand, the two other products are great finds as there are no questions about their durability and safety. However, they slightly differ from each other. 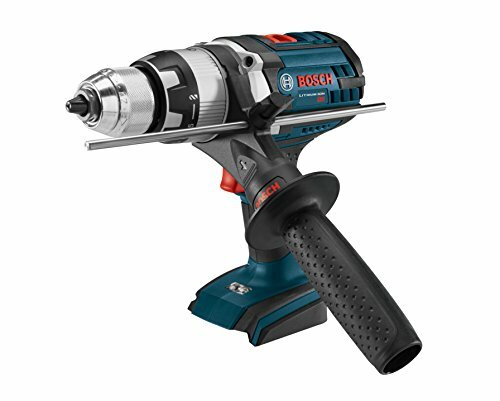 The Bosch HDH181XB Bare-Tool Hammer Drill is powered by batteries while the VonHaus 10 Amp VSR 1/2 Inch Pistol Grip Hammer Drill Kit runs on an electric cord. The speed in which one can drill is different, too. The latter has higher speed as it can drill up to 3000 RPM compared to the 1850 RPM of the former hammer drill. However, it is not to say that Bosch is already defeated. After all, its cordless feature makes it perfect for construction sites that are far from any wall plug. Plus, it has a built-in LED light so users can see what they are working on or can see clearly even in low-light situations. If one values portability more than speed, then the Bosch HDH181XB Bare-Tool Drill is the equipment to choose. It is well-built and comes with an all-metal box to protect the drill and for easier portability. 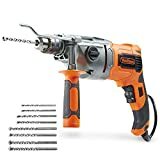 However, if one needs a drill that can do the job much quicker, then VonHaus 10 Amp VSR 1/2 Inch Pistol Grip Hammer Drill Kit is the better option. In the end, both hammer drills are great finds.